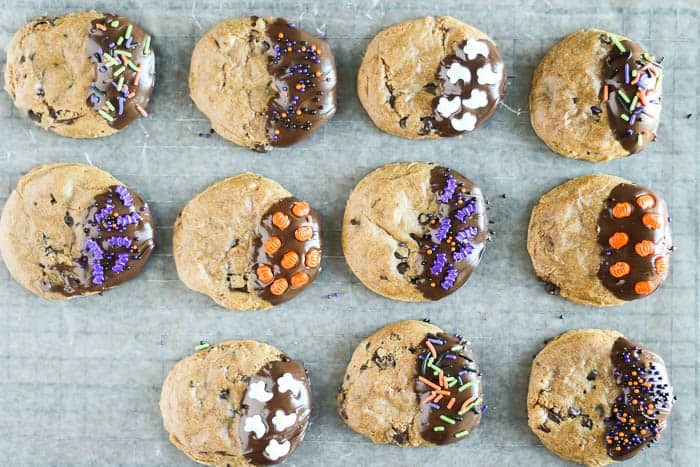 Keep all your ghosts and ghouls happy with these Gluten Free Halloween Cookies! I feel like I never really do enough for Halloween. It’s such a busy time of the year that I sort of end up just doing the bare minimum. The kids always have their costumes and I always buy candy to give out. Thankfully, my oldest son likes to put the few decorations we have out or that might not get done either! This year, I have decided to start early. 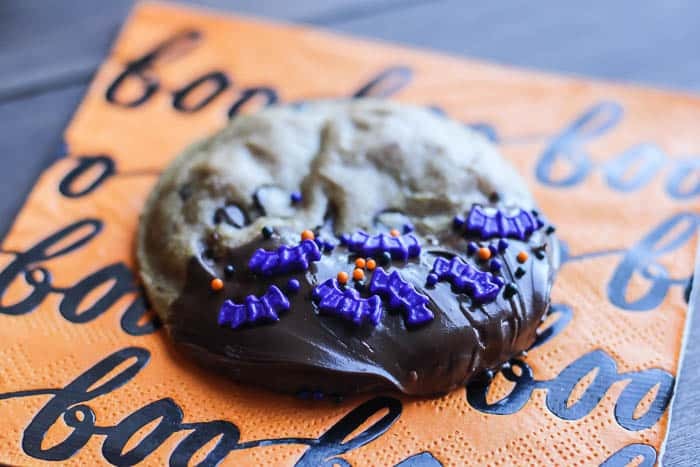 I actually bought a few new decorations and decided to create an easy Halloween cookie recipe to share for moms like me. You might know the type. The mom who wants to do it all, but just doesn’t have time. These cookies are for you…and your kids, of course! 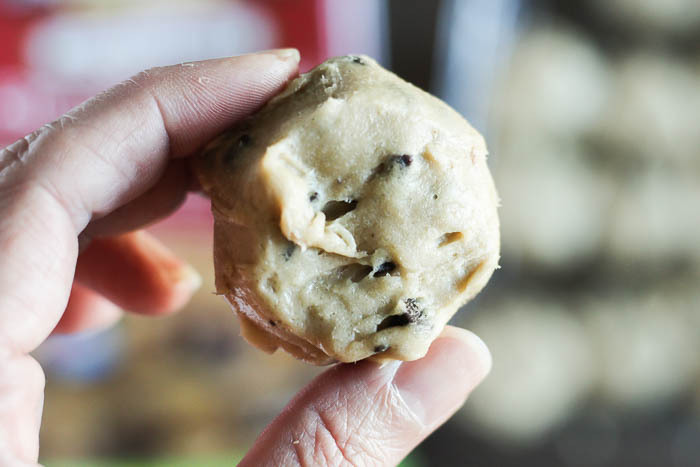 Using a pre-made, pre-portioned cookie dough saves a ton of time! After the cookies are baked and cooled, it’s just a matter of melting some chocolate and decorating them. Your kids will love making these cookies with you! 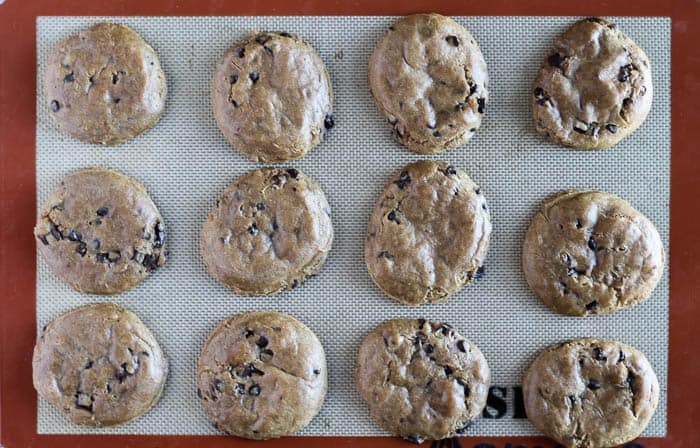 For this recipe I use Immaculate Baking Company’s Gluten Free Chocolate Chunk Cookies. You can find them in the refrigerated dough section. I have to tell you, I can’t even tell they are gluten free! They bake up perfectly with crispy edges and chewy centers! These are a great option for family members who eat gluten free, or if you are planning on having a party because everyone will love them! You can print a coupon to save $1.00 on Immaculate Baking products HERE. 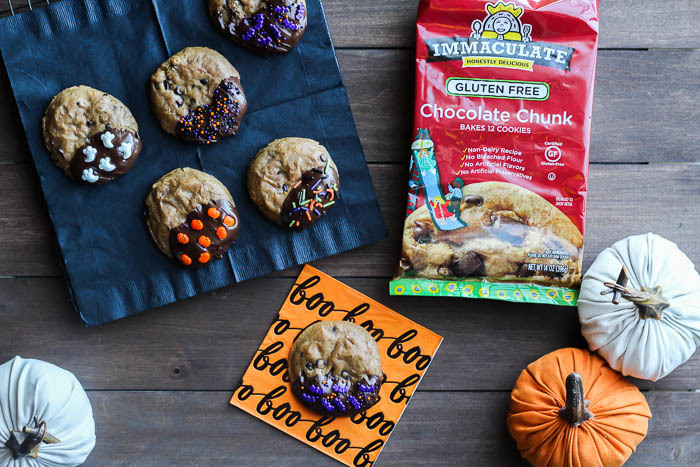 Immaculate Baking Company’s mission is to create wholesome baking products. A lot of the varieties are gluten free or organic. 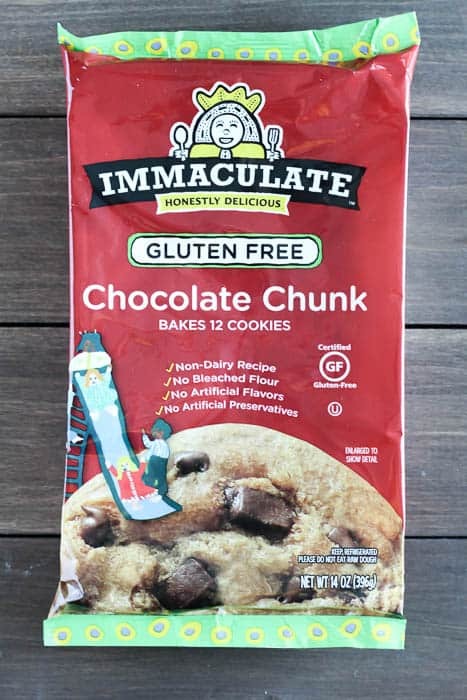 You can use whichever Immaculate Baking Company cookie dough you prefer best with this recipe! Bake the Immaculate Baking Company cookies and let cool completely. While the cookies are baking get out whatever you are using to decorate the cookies with. I like to use a variety of Halloween-themed sprinkles. Once the cookies are completely cool, melt the chocolate chips in a microwave-safe bowl for 1 1/2 minutes on 50% power. Stir. If more time is needed place the bowl back in the microwave for 15 seconds, then stir again. 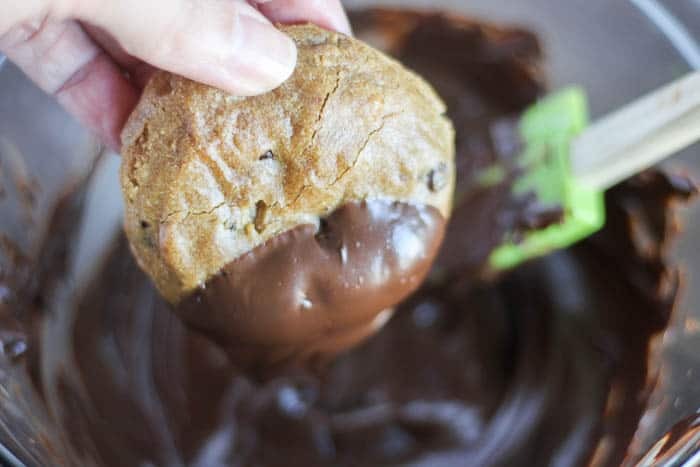 Dip each cookie 1/3 of the way into the melted chocolate, letting any excess drip off before placing it back on the cooling rack or onto a sheet of wax paper. Immediately sprinkle on the decorations of your choosing. You can place the cookies in the refrigerator to help the chocolate set faster, if needed. It’s always fun to use Halloween themed plates, napkins, and other decorations, especially if you’re having a party! 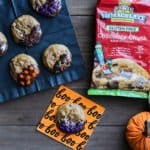 I hope this easy recipe for fun Gluten Free Halloween Cookies makes your holiday easier! Don’t forget to print your coupon for $1.00 off of Immaculate Baking products! Preheat your oven to 350°F. 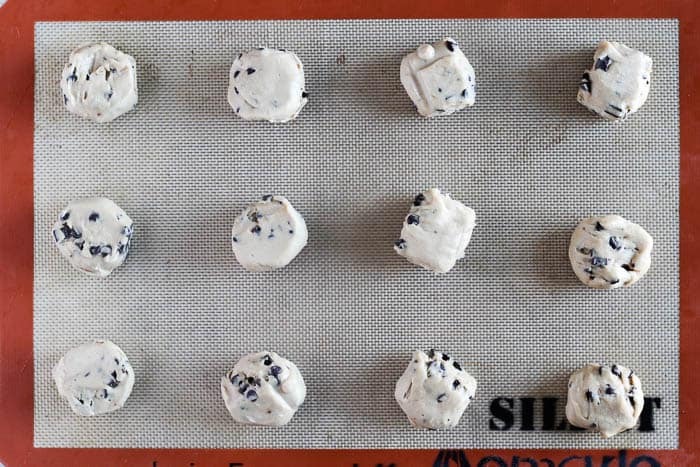 Place the pre-portioned dough onto a cookie sheet 2 inches apart and bake according the instructions on the package. 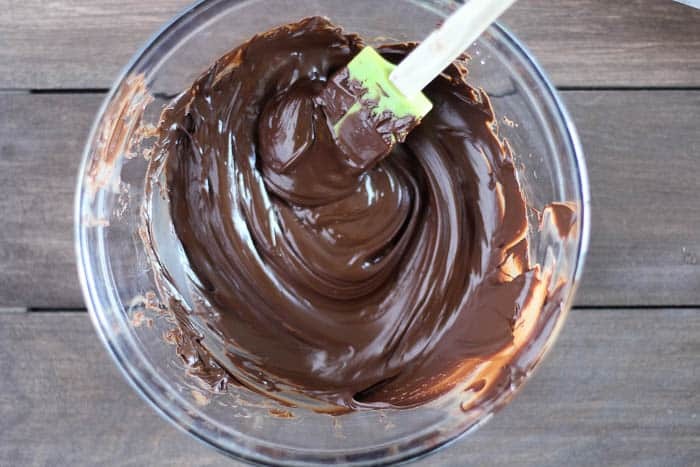 Dip each cookie 1/3 of the way into the melted chocolate, letting any excess drip off before placing it back on the cooling rack or onto a sheet of wax paper. Immediately sprinkle on the decorations of your choosing. You can place the cookies in the refrigerator to help the chocolate set faster, if needed. Dipping them in chocolate takes them over the top! We love these cookies! I have some in the fridge, I am going to make these for my kids! So cute! You are a girl after my own heart! I used to love to bake from scratch, but sadly I don’t have the time. But I still love sweets, so I am all about doctoring some frozen cookie dough or a box of cake mix. I can just imagine how yummy these cookies are dipped in chocolate. Great Halloween specific ideas for the cookies. And so easy to make too. Good to know about the immaculate company cookie dough.